We are so grateful for our church, College Church of the Nazarene. We especially enjoy the LIFE group to which we have been assigned. The group has loved and supported us like their own family. God definitely knew in which group we belonged. In the last 10 days, I have fallen twice. Falling is not pleasant. Fortunately I did not need to go to the hospital with either fall. We were blessed last summer to have a new medical building built just across the street. Our primary care doctor now has an office in that building. We can literally walk across the street for the majority of our medical needs. They have an urgent care center in the building, and we visited there after one of Marilyn’s falls. It turns out that the unusual sores on Marilyn’s shin are a recurrence of shingles. This will make the fifth time. No pain this time, so I would say the shingles shot worked! After the second fall, our doctor was not able to see Marilyn, so they arranged for another doctor to see me. I quickly found out that the new doctor was a Christian, so we had a nice chat. After x-rays were taken she was quick to report to me that no bones were broken the second time either. We had the privilege of hearing the Kansas City Symphony Orchestra once again. Had we mentioned that the conductor is a son of violinist Isaac Stern? This year would be Leonard Bernstein’s 100th birthday. Michael Stern, our conductor, grew up knowing him as Uncle Lenny. Introducing the Bernstein violin Serenade, Michael told us that when the piece debuted, in 1954, his father was the artist. Michael said he had no memory of the debut because he hadn’t been born yet. Remarks like that give us tender insights into Michael’s musical background. 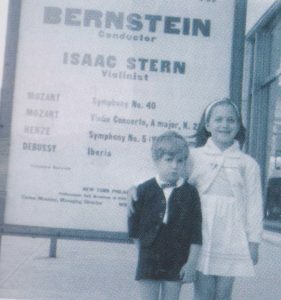 The picture is Michael at age 4 with his sister at a later performance, conducted by Bernstein featuring his father Isaac. We have bought season tickets for next year, too. As we write this newsletter it is February 10. It is hard to think that 35 years ago our boy Nathan was killed by a drunk driver. We have had the practice of sending balloons off this day in remembrance of all three of our boys. Several years ago while at Morro Dunes RV Park on the California beach we met Wally and Vicki. 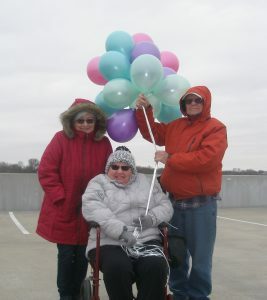 Marilyn learned that Vicki’s mother had died suddenly and Vicki asked if we could also remember her mother at the balloon launch. 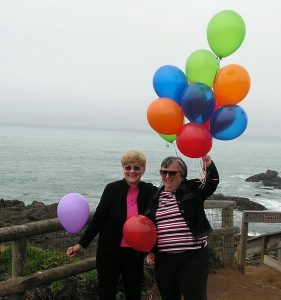 We, of course, said yes and a new tradition with four balloons was established. Wally and Vicki have now moved to Kansas and today were able to join us for today’s launch. The temperature today in Kansas was 19 degrees. I don’t remember what it was on the beach in California, but I’m sure it was warmer. Please pray for me that I will not fall again. This is very important to me. Please pray for Glen also that he will continue to enjoy good health so that he is able to care for me. I am also praying that my eyes will provide me good eyesight so that I may be able to read by myself. For my morning Bible reading, Glen reads aloud to me. I am so grateful that Glen is willing to read to me. Thank you for being willing to pray for us.